The Gospel Music Association (GMA) announces more presenters and performers to appear at the 45th Annual GMA Doves Awards (www.doveawards.com). Current nominees set to appear are for King & Country, 1 Girl Nation, Ellie Holcomb, Tedashii, David and Tamela Mann, Al and Lisa Robertson of Duck Dynasty and Sandi Patty. The Dove Awards will take place on Tuesday, October 7 at Allen Arena on the campus of Lipscomb University in Nashville, Tenn.; set to air on the Trinity Broadcasting Network (TBN) on October 12, 2014. For Dove updates and breaking news, please visit the Gospel Music Association’s social networks. These top artists will join the recently announced co-hosts Bart Millard of Mercy Me and Lecrae, as well as Natalie Grant, Hezekiah Walker, Erica Campbell, Capital Kings, Olympic Gold Medalist Scott Hamilton, author Karen Kingsbury and Bill Gaither as participants on the show. The pre show hosts include Dove nominees Jonathan McReynolds and Meredith Andrews. Once again, the nominee luncheon will be sponsored by the Cantinas Foundation and will be held at the Schermerhorn Symphony Center in downtown Nashville. “Congratulations to all of this year’s Dove nominees. On behalf of the Cantinas Foundation, we want to thank you and bless you for that you are doing for the kingdom. May the Lord send you a fresh wino of His spirit as you continue and to inspire and touch other through your music,” says Wendy M. Hughes, Director, Cantinas Foundation. 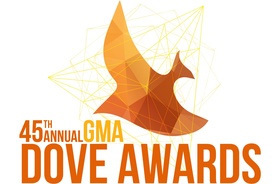 The 45th Annual GMA Dove Awards will take place on Tuesday, October 7, 2014 at Allen Arena in Nashville, Tennessee at 6:30pm CT. The show will air exclusively on the Trinity Broadcasting Network (TBN), America’s most watched faith channel on October 12, 2014. The pre show, red carpet and behind-the-scenes will be airing on www.hearitfirst.com. Tickets are available now at www.doveawards.com. For a complete list of nominees, please visit www.doveawards.com/nominees. This entry was posted in Christian Contemporary and tagged 2014, 45th annual, performers, presenters, The Gospel Music Association (GMA) by Kris Patrick. Bookmark the permalink.